I needed, OK I wanted a pair of new shoes. The thing is I don't do shoes that everyone else has, My shoes are where I really express myself, I even have toe tennis shoes. I had gotten a sneak peek of Northcott's sewing themed fabric line and I fell in love. I thought why don't I use some of that fabric on a pair of tennis shoes. 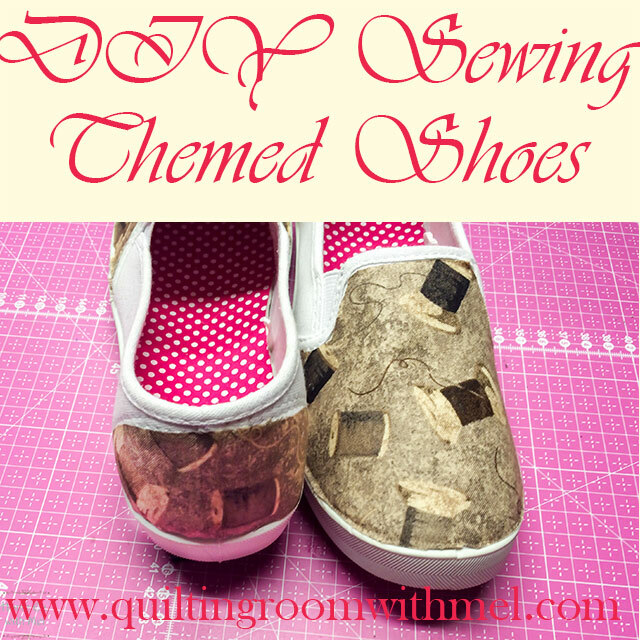 That way I get to show off some of my favorite fabric, no one else has them in my area, and I hopefully can inspire you to make your own sewing or quilting themed tennis shoes. 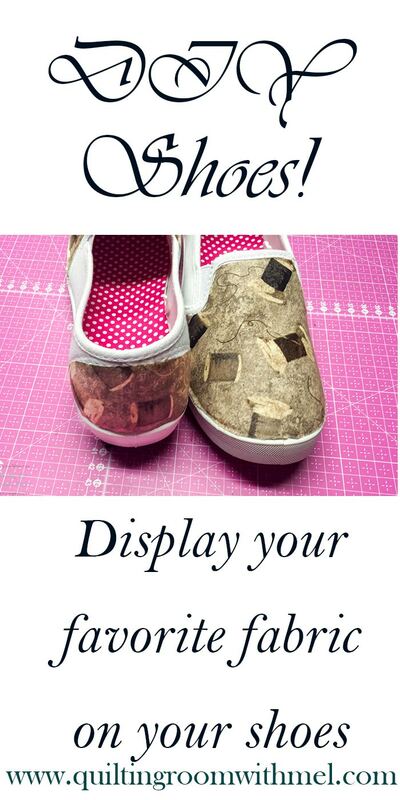 The amounts of fabric and fusible web will depend on your shoe size. I'm a size 7 1/2 - 8 depending on how wide they are. These are 7's because they are actually wide enough to get my feet in. I have really wide feet. So finding a shoe that's wide enough make me happy. These are cheap shoes from Walmart. The nice thing is at that price I can have a whole line of sewing themed tennis shoes. If you follow me on Instagram you saw the painter's tape with a sneak preview you know I burned myself in the making of this project. I laid my arm down on the stand for my Clover Iron. Thankfully, a friend gifted me a huge bunch of aloe plants so he taped that over the burn. He told me when I read the comments on Instagram that the reason he didn't use the duct tape was because it would have pulled all the hairs off of my arm. I'm happy he thought of that before wrapping me up. He used to do emergency medical so maybe he's retained a few things. We start by making a template of the toe and the heel. I had considered doing the whole shoe but realized it was a little too much. I also looked around at other "funky" shoes from big name designers and they weren't doing all over designs either. 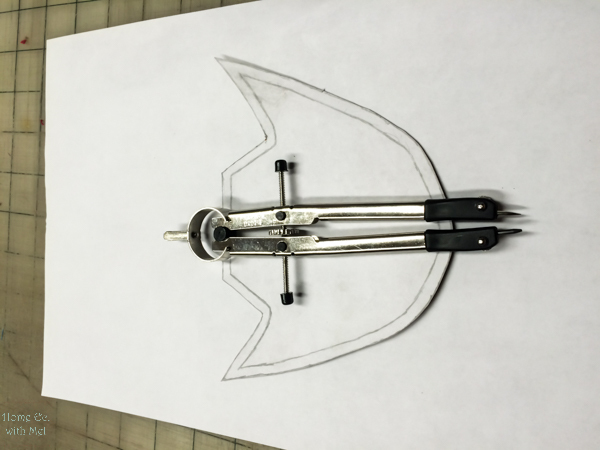 Final Template - The compass is how I added the 1/4" extra It's already on the cardboard here. 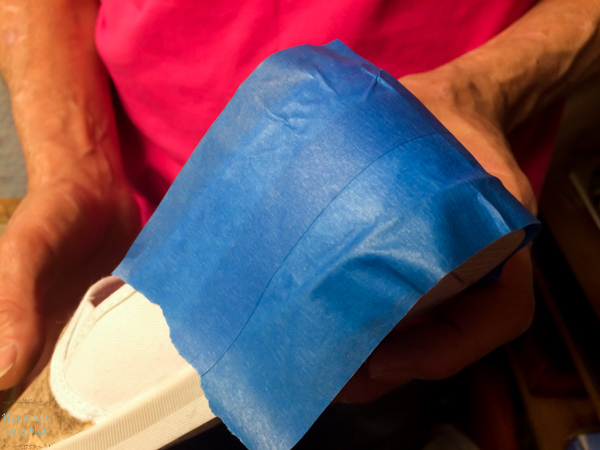 Paul used panter's tape to get the shape of the heel right. 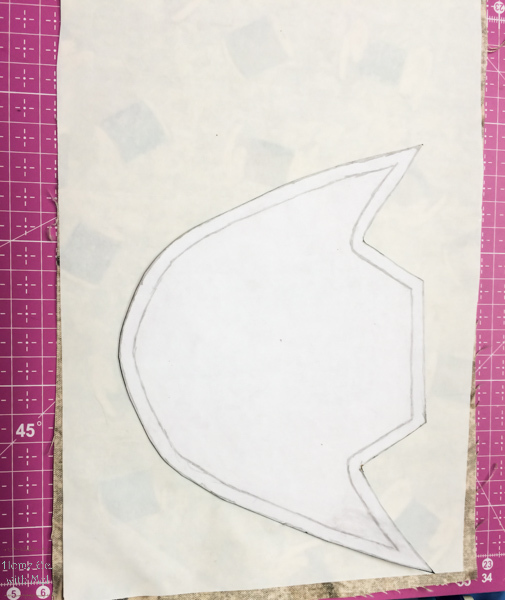 He carefully trimmed the excess tape off and then used the tape to create a cardboard template. Once I got the paper template done I traced it on to a piece of thin cardboard out of our check mailer. I added 1/4" in case I was too small anywhere on the toe. It's easy to cut off fabric but hard to add fabric on. 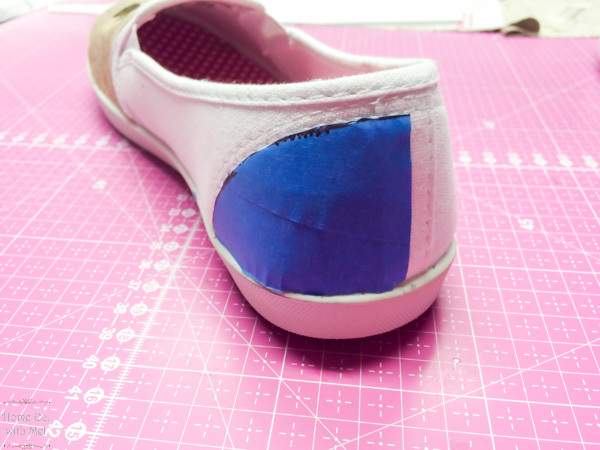 Paul did the template for the heal while I was working on one shoe. That's why the painter's tape was close by when I burned myself. 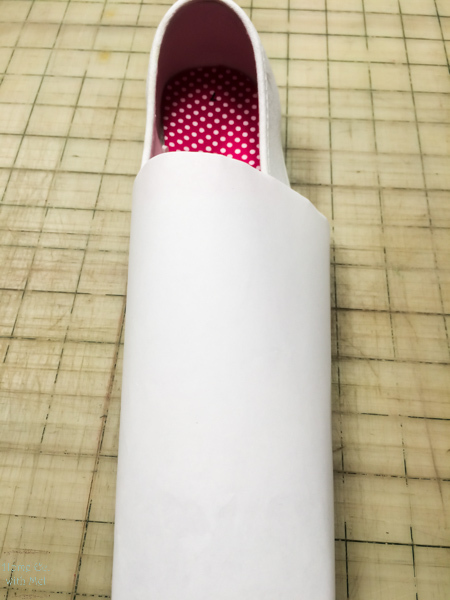 Follow the directions on your fusible web choice to attach it to your fabric. I use Heat n Bond because not only is it easy to find but it has never failed me in all these years. Once you have it attached trace around your template and cut it out. Make sure that your template is on your fabric the right direction if your fabric is directional. I almost goofed my heel putting it upside down. I did a video of how I ironed the fabric on. I did the exact same thing to heel. 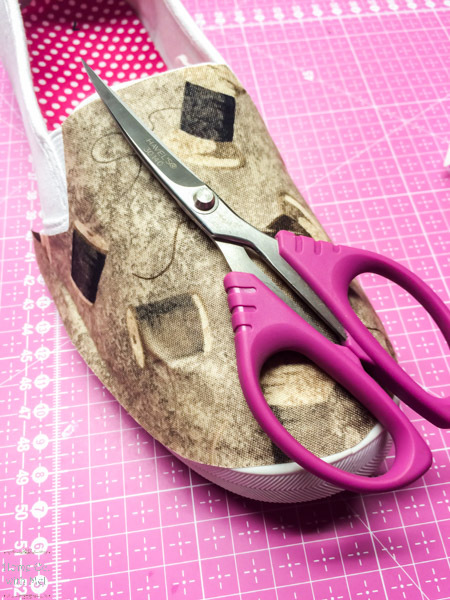 I used my embroidery scissors to trim extra fabric off the toe. Now I hope the six inches I cut off of my yardage doesn't short me for the project I originally bought the fabric for. You know how much I hate to buy more fabric. Don't forget to check out all of my small projects. They are great for quick gifts or just to feel satisfied you finished something. Modge Podge has a sealant you can put over the top of the fabric, I think it makes it water proof.